That's bacon, avocado, lettuce and tomato on lightly toasted sourdough with garlic mayo in other words ;) I've decided I'm going to stop apologizing for my sandwich posts. I always seem to think they are not 'blog' worthy, and yes there is nothing overly original here...but sometimes we all need help with ideas and most importantly - this was amazing!! Plamil garlic mayo - it's the best! 2 slices vegan bacon - fried, I used vegi-deli. Lightly toast the sourdough and spread with the margarine and garlic mayo, grind some black pepper over top then add the bacon, avocado, tomato, sprinkling of smoked sea salt and top with lettuce and the other slice of bread. Enjoy! Thanks! 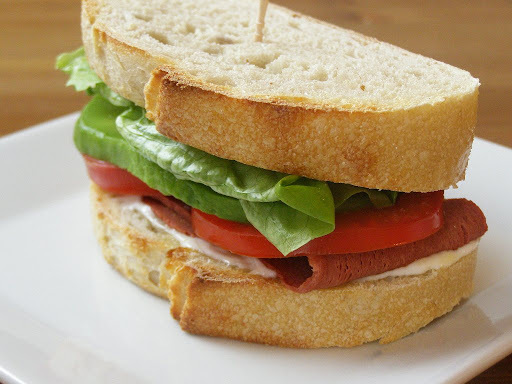 Yeah, BLT's are the best aren't they?? Look forward to your post, sounds sublime! Cheers Philippa! That's so true! !